These last few days I’ve been in California with a delegation of leaders from Franconia Conference. We are here to cultivate further relationships with a group of churches who have expressed a desire to join our Conference. 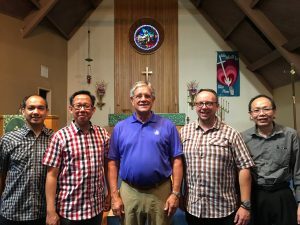 All four congregations are immigrant churches who have been connected with the Anabaptist movement for years. We find ourselves in this space together to build on past informal collaborations, to build relationships and trust. Meanwhile, at the same time that we are here, all hell seemed to break loose in Charlottesville, Virginia. The east coast felt very far away from this side of the country. Yet, reading on my iPhone and following social media meant that the scenario wasn’t far from my mind as we met together. Most of these initial meetings have involved a lot of listening. As we are listening, I am reminded again that the process of transforming racism and xenophobia begins with a willingness to listen, to be challenged and to be changed. Franconia Conference leaders with pastors Buddy Hannanto (2nd from left) and Virgo Handoyo (right) in San Gabriel, CA. As the days have built, they’ve also involved a lot of eating together and extensive travel time on the freeways that crisscross the massive urban sprawl of Southern California. Yet in the middle of the conversations, I sensed more and more the possibility that emerges through honest listening that allows some vulnerability. Our delegation, John Goshow (board moderator), Mary Nitzsche (Associate Executive Minister), Aldo Siahaan (LEADership Minister) and I, represent one of the oldest configurations of Mennonite-ness in the hemisphere. Largely shaped by the experience of Germanic people, here we were listening to the experiences of immigrants and people of color on the West Coast. We were challenged to recognize that our systems aren’t always friendly to people who speak English as a second or third language. We were challenged again that our established patterns aren’t always reflective of the movement of the Spirit that had and continues to stir a global movement of people who live in the way of Jesus. In the meantime, we were served lovely meals and received gracious hospitality. This is not always easy work. Those of us attached to these systems sometimes feel a need to defend them. Taking a listening posture rather than a defensive one allows us to hear both critiques and affirmations. I find that often as a white dude who is leading in this system, I want to protect our organizational process and the validity of the way that we do things. I don’t think that we have constructed systems with an intention to be oppressive or biased, yet often times they are. There is still work to do as we seek to be representative of the reign of God yet to come with persons from every tongue, tribe and nation. Recognizing that the journey toward reconciliation of all people is more than I will ever accomplish doesn’t allow me to sit idly; it requires each of us in our time, place and space to do the work that we are invited toward that represents God’s Pentecost intent. 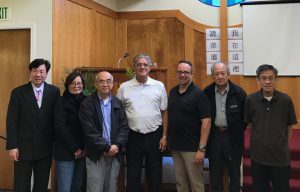 With leaders at San Francisco Chinese Mennonite Church. In the meantime, we are being transformed by relationships with people who open their lives and stories with us. The pain and the celebrations are real. We can bear witness to these things together along with Christ who weeps and who also rejoices. This fall we will have opportunity to continue to be transformed as a Conference community as at least five immigrant congregations seek to join us as new members. We will have ongoing opportunity to listen together, to extend Christ’s great shalom intended for us and for the whole world. This is will likely be our work for our time as a community together. NOTE: Stay tuned for more information on the congregations looking to join Franconia Conference. Also, delegates – be sure to register for Assembly Scattered Meetings which will be a time of listening and discerning together regarding these congregations.